A recent study revealed that pet ownership could save the NHS up to £2.45 billion a year, simply by being a pal. The thinking behind the figure is that they will reduce the number of visits we take to the doctor because of their positive impact on our health, both mental and physical, and wellbeing. So, in honour of International Cat Day here are four ways we think cats make our lives better. They make great conversation topics. It’s true and those who hate small talk might have been extremely glad to find a common connection through a mutual love of pets. They can reduce our stress. The sound of a purr is pretty relaxing, isn’t it? Whether it’s the sound or a reaction to giving our cats fuss, it’s well known that cats can trigger soothing chemicals in our brain which help to reduce anxiety and stress. They can even improve our heart health and reduce the risk of having a stroke. According to new research from AXA PPP healthcare owning a cat has been associated with a reduced rate of dying from cardiovascular disease (CVD) and stroke, due to the stress-relieving effects of animal companionship. Our cats love us for who we are, not where we work, how we look or how successful we rate ourselves compared to others on social media. 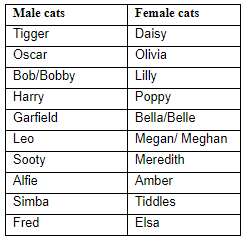 And if you’re thinking of getting a cat, here are the popular cat names according to Natures Menu. So, whatever you get up to on International Cat Day, from our cat crew to yours, have a good one.